Last night I wasn’t in the mood to cook. It’s been a busy week catching up on all the work that had piled up since I went back to Ontario and I had inadvertently skipped lunch which left me at dinner time feeling all woozy and tired. Just thinking about dinner — let alone getting up the energy to make it happen seemed like too damn much. But being the frugal girl that I am, I didn’t want to order in take-out since we’re in “Get-Ready-Set-Europe!” savings mode. Instead, I did what most modern cooks do. I went online to epicurious and typed in a couple things I had in my fridge and out popped a couple super simple recipes. The fish recipe seemed too simple to be good, but I read all the comments and decided to give it a go and I’m glad I did. 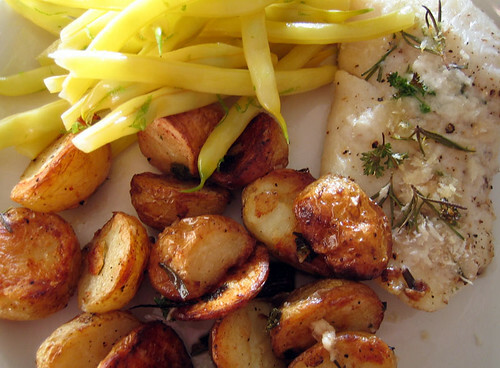 How can you go wrong with crispy roasted rosemary scented potatoes and fish? I added parsley in addition to the rosemary since my balcony garden has been brimming with these 2 herbs and I just used cod since that’s what I had on hand. The original recipe called for bread crumbs so I subbed in panko crumbs instead, but next time, I’ll skip the breadcrumbs altogether (and I’ve omitted them from the recipe below). Trust me they added nothing. But what to do with the super fresh local wax beans I had just purchased? I could have just steamed them, but instead I decided to tamper with another epicurious recipe, using limes instead of lemons and adding the juice for extra zest. Yum! This entire meal was so fresh tasting and simple to prepare. Add a pint or two of ice cold beers and it’s pretty easy to forget that I was on the brink of calling for take-out. These recipes saved my day. Really. 1. Preheat to 400°F. Place the potatos in large baking dish, pour 2 tablespoons of the olive oil over them, add most of the rosemary & parsley (saving some for later), all the garlic cloves, and salt, and pepper. Toss thoroughly. Put the dish in the preheated oven. After 20 minutes, turn the potatoes over and put back in the oven. Cook until the potatoes feel tender when tested with a fork, another 15 minutes or so. 2. Remove the dish from the oven. Push the potatoes to the sides, making room in the center for the fish fillets to lie flat. 3. Rinse and pat dry the fish fillets, laying them flat in the dish. Scatter the remaining parlsey & rosemary over the fish, add salt and pepper, and the remaining 1 tablespoon of olive oil over the fillet. Return the dish to the oven and bake for 10-15 minutes, depending on how thick your fillets are. Plate and serve with Lime & Honey Wax Beans and a couple of cold ones. Cook beans in a pot of boiling salted water until just tender, 6 to 8 minutes. Drain in a colander and rinse under cold water to prevent further cooking. Immediately toss with honey, zest and juice, and salt in a large bowl. I would be very merry with this wonderful food! The potatoes are so beautifully browned, yummy! 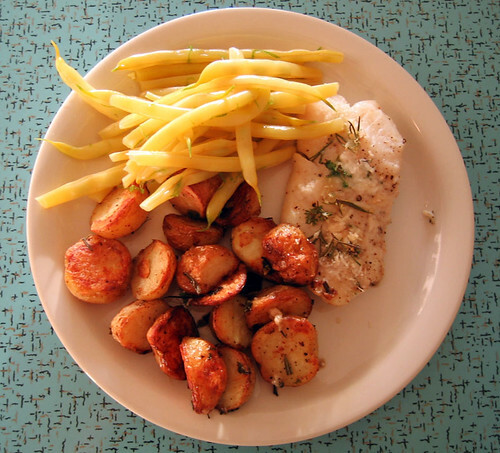 J’adore poisson, pomme de terres avec rosemary et haricorts jaune! Tres bien. Hiya – just practicing my French. Some of my best meals have been discovered from leftovers and “throwing things together” from whatever you have on hand. Funny though, I haven’t seen yellow wax beans in the market at all. Your beans look awesome as do the rosemary potatoes, crisp and golden brown just the way I like ’em. eviedee, it was a marvelous dinner and i can’t wait to make it again. patricia, very merry indeed 🙂 the potatoes were perfection! yes, mevrouw, we’ll definitely meet up in amsterdam! i can’t wait!! joanne, it seems wax beans have only recently shown up here, so wait a bit and they should show up where you are very soon! i love yellow beans. steam the beans then toss into a pan with the butter, juice, zest, salt and pepper and saute – add the dill at the end. Yum. Next time I’m trying yours! I made this tonight, after seeing it on your blog this afternoon and was pleased by the way it turned out! And i don’t cook a lot, so my husband was very pleased! Thanks for the inspiration! yum, yummy, yummy…I never comment but look at your blog all the time…love it!